Why has the literature on Asian development not addressed the issue of money politics in Korea? How can we reconcile the view of an efficient developmental state in Korea before 1997 with reports of massive corruption and inefficiency in that same country in 1998 and 1999? Politics is central to the answer. 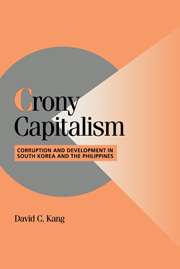 This study argues that both Korea and the Philippines experienced significant corruption throughout the post-independence era, and that political--not economic--considerations dominated policy making in both countries. List of figures; List of tables; Acknowledgements; 1. The puzzle and the theory; 2. Comparing Korea and the Philippines; 3. Institutions: bureaucrats and rulers; 4. Mutual Hostages in Korea; 5. Bandwagon politics in the Philippines; 6. Democracy in the 1980s and the financial crisis of 1997; 7. Conclusion: corruption and development; Index.